Paisley Underground returns for the third consecutive year with 3 nights of live music from 3 Scottish record labels. First up on September 14, Gerry Loves Records presents Rick Redbeard and Wounded Knee at Paisley Arts Centre. Rick Redbeard is the solo musical alias of Rick Anthony, singer from acclaimed Glasgow sextet The Phantom Band. Born and raised in the Aberdeenshire wilderness, Anthony began using the Redbeard name for his solo material sometime around 2006-7 after swindling it from a pirate. He has performed sporadically around Scotland since then, and the Gerry Loves Records split 7″ is the first Rick Redbeard release of any nature. He is currently at work putting the finishing touches to his debut album. Second on the bill is Wounded Knee. Wounded Knee is Drew Wright, a singer and experimental vocalist based in Leith, Edinburgh. He has been making music since 2004 and is an experienced live performer. Inspired as much by minimal techno as folk forms he creates a strange and timeless Janus music that looks both to the chants, ballads, shanties and worksong of the old and the mechanised minimalism of the new: future primitive music. Paisley Underground is once again providing platforms for local artists by offering Reid Kerr College students, Deerhound, a support slot for the show on September 14. Doors are at 7pm. Tickets cost £5 and can be purchased by calling 0141 887 1010 or logging onto www.renfrewshire.gov.uk/onlinebooking. 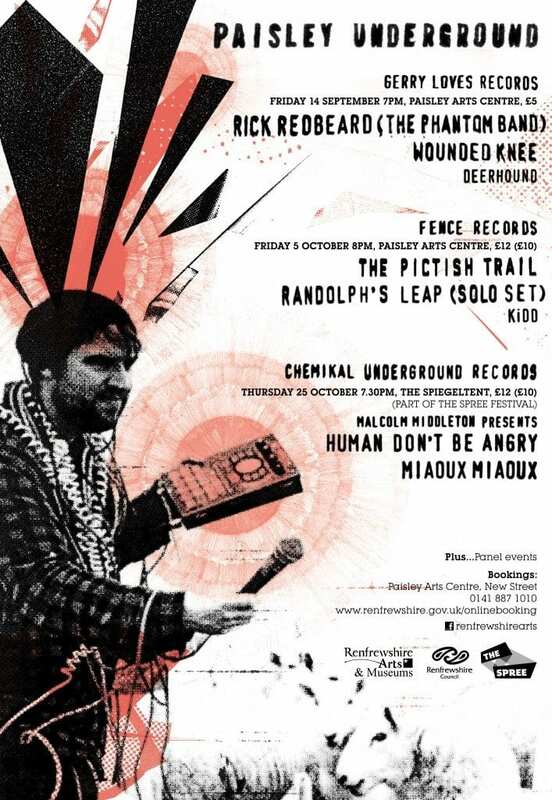 Later in the programme, (Fri 5 Oct) Fence Records will be showcasing The Pictish Trail and Randolph’s Leap (Adam Ross solo set) with support coming from Reid Kerr graduates KiDD. Finally, the mighty Chemikal Underground roll into Paisley on Thurs 25 Oct with Human Don’t Be Angry and Miaoux Miaoux, who will be playing in a Spiegeltent on County Square, opposite Paisley Gilmour Street train station. The Chemikal Underground night is also included in The Spree Festival line up which takes place in Paisley from 25 – 28 Oct.
Paisley Underground is again committed to developing emerging talent by providing support slots for young musicians and running free Music Industry led Panel Events with industry professionals prior to the Fence Records and Chemikal Underground Nights. For further information on any of the Paisley Underground events please visit www.renfrewshire.gov.uk/events or follow us on www.facebook.com/renfrewshirearts.